Craving fresh, easy dinnertime recipes this summer? Me, too. 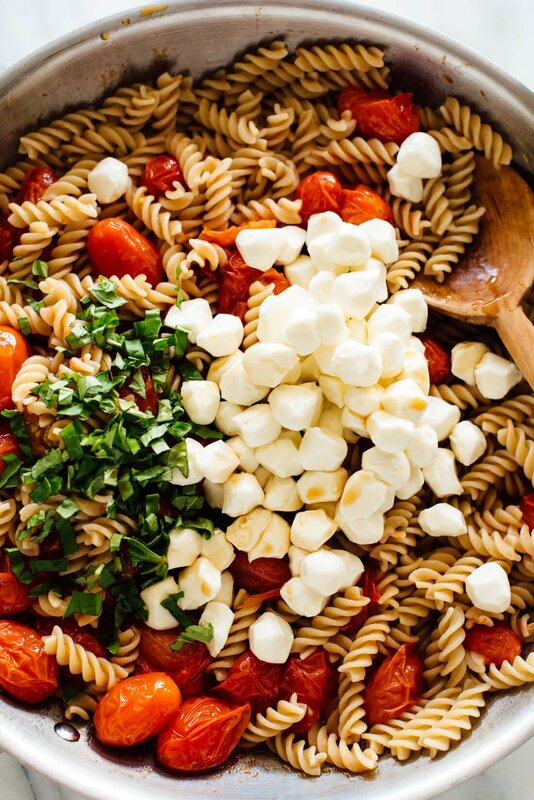 This Caprese pasta salad recipe is just the ticket! This recipe has been one of my favorites for the past five years, and I’m re-sharing it today in case you have missed it. 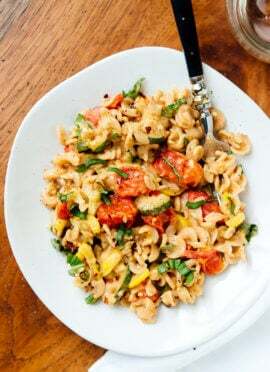 This pasta recipe really straddles the line between “pasta dish” and “pasta salad,” since it’s great whether you serve it warm or cold. It’s made simply with whole wheat pasta, lots of cherry tomatoes, mozzarella pearls, fresh basil and olive oil. Briefly cooking the tomatoes on the stove makes their bright flavor sing. It also releases some juices that combine with the olive oil to turn into a light pasta sauce. Dinner is ready in twenty-five minutes. This recipe started to take shape while my little brother was in town, way back in the summer of 2013. We stayed in for dinner to save money. He ate leftover cheese pizza, while I haphazardly threw some cherry tomatoes in a pan and reheated spaghetti. He eyed my pasta while I wished for more pizza. I’ve refined the recipe several times since then and it’s about as simple as can be. Boil water for pasta, cook cherry tomatoes whole in the meantime, and toss in some chopped basil and mozzarella balls at the end. This recipe was roughly inspired by the classic Caprese salad. Caprese salads might be ubiquitous this time of year, but for good reason. 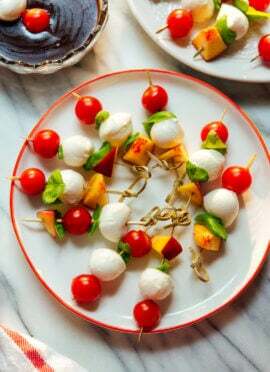 You really can’t go wrong with any combination of mozzarella, basil and ripe, peak-season tomatoes. Pasta just plays a supporting role in this recipe. The idea for cooking the cherry tomatoes comes from Tom Colicchio’s recipe for squid with burst cherry tomatoes in Food & Wine’s August issue. If you haven’t tried burst cherry tomatoes yet, you’re really in for a treat! This dish might seem a little watery after you stir the pasta into the tomatoes, but don’t worry. Give it a 20-minute rest and you’ll find that the pasta absorbs some of the moisture and the sauce thickens up. Mozzarella “pearls” seem to be pretty easy to find these days (they are little mozzarella balls about the diameter of a dime). If you can’t find them, you can buy a standard mozzarella ball and tear it into smaller pieces, or cut any mid-sized mozzarella ball (Ciliegine) into smaller pieces. The balsamic vinegar is a key component here. If your finished dish doesn’t quite taste spectacular, add a little more of it. Use white balsamic vinegar if you can (it’s generally available next to the regular balsamic in the vinegar aisle), but regular balsamic will work, too. If you want to stretch this recipe a bit to serve a larger crowd, use 8 ounces pasta and 3 pints of cherry tomatoes. Then add some extra basil and vinegar, to taste. You can get by using less olive oil, if you’re worried about using 1/3 cup here. But I think it’s totally irresistible as written. 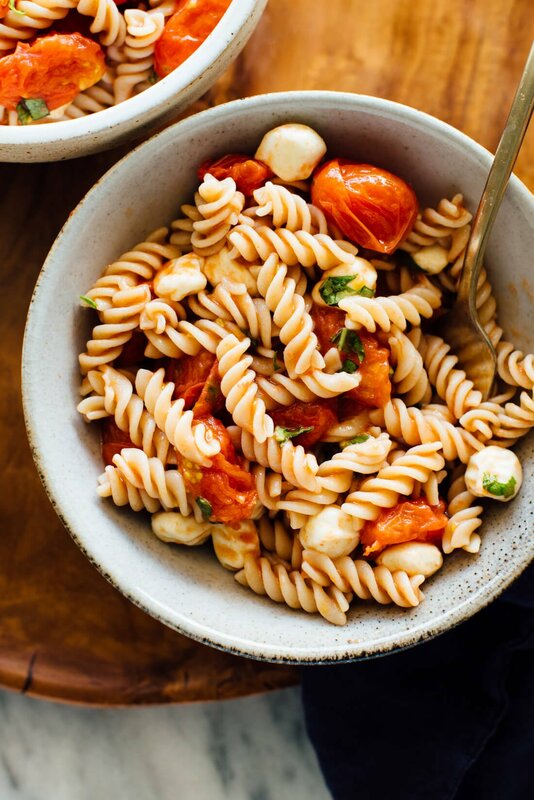 This Caprese pasta salad recipe is easy, delicious and perfect for summertime! 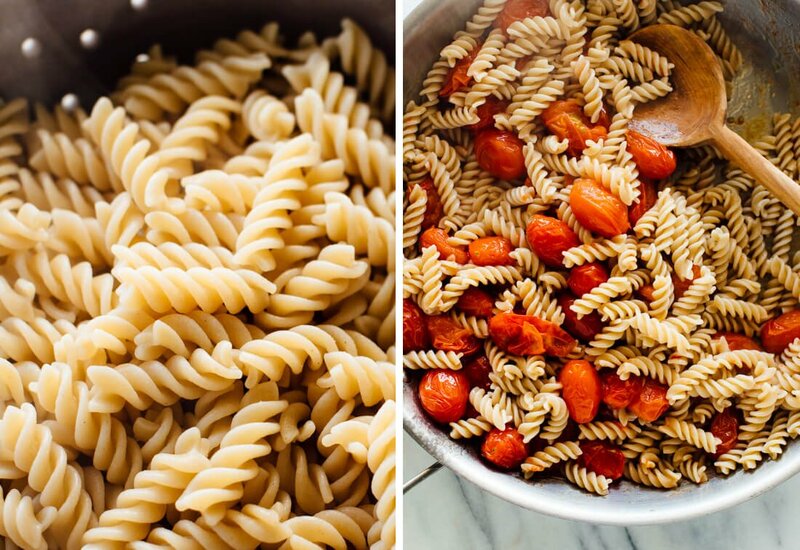 Just cook cherry tomatoes with olive oil to make the perfect pasta sauce. Recipe yields 4 modest servings. Bring a large pot of salted water to boil and cook the pasta until al dente, according to package instructions. Drain the pasta and set it aside. While the pasta is cooking, combine the olive oil, tomatoes and salt in a large, non-reactive skillet or Dutch oven over medium heat. Cover the skillet (use a baking sheet if you don’t have a better lid). Cook, stirring occasionally, until most of the tomatoes have started to burst out of their skins and the olive oil has a light red hue (about 6 to 12 minutes). Remove the skillet from the heat and stir in the cooked pasta. Let the mixture cool for a few minutes while you chop the basil. Stir the mozzarella balls and basil into the pasta. Add the vinegar, then taste and add additional vinegar and/or salt, if it doesn’t quite taste spectacular yet. For best flavor, let the mixture rest for about 20 minutes, so the pasta can absorb some of the sauce. Or, refrigerate it for future use. This salad will keep well in the refrigerator for up to 4 days. Leftovers are great chilled or at room temperature. You can also reheat the pasta if you don’t mind the mozzarella melting (yum). Make it gluten free: Use your favorite gluten-free noodles. Make it vegan: This recipe would still be nice without the mozzarella. If you would like to add some creaminess, add a dollop of my vegan sour cream to individual servings before serving (see my cookbook, page 217). Recommended equipment: An enameled cast iron Dutch oven is the perfect cooking pot for the cherry tomatoes (it’s also great for cooking pasta and soups/stews, and it will last forever). I absolutely love this pasta! This is what I love to eat! Beautiful and so tasty. Yummers! How do you suggest reheating this for lunch the next day? I fear the mozzarella would melt too much.. .maybe eating cold is just fine? Great question! I like this salad chilled, or at room temperature, or reheated… I like the melted mozzarella. What a beautiful recipe! I love the simplicity – I bet it really lets the flavors shine. Oh, and I listened to that TED talk, too. That was something I think every person needs to hear before they’re 25. No mention of heating the olive oil in the pan before adding the tomatoes, but is that what you meant? In the summer I put halved or diced tomotoes in a bowl with salt and olive oil cover it with plastic wrap and leave it out in the hot sun 30-40 min. Pour the hot pasta over it – it’s a great no cook sauce! Thank you for pointing out that omission! Yes, that’s exactly what I meant. Your summer tomato sauce technique sounds amazing. I LOVE this sauce idea!!! Thanks for sharing! Thanks, Jessica! Hope you’ll get a chance to try it soon. This looks brilliantly simple and delicious. Thanks for the idea! Love the simplicity to this! Caprese anything has my name all over it! This looks simply and lovely – meals that come together quickly in summer are wonderful. I also love the look of the wholewheat fusilli. Gorgeous! Hi Kate! I just found your blog and I love it. I’m a vegetarian as well so I’m about to raid your recipe list! Seriously, you have a beautiful site and this pasta is deliciously simple. Great work! Thanks, Sarah! Glad you found my blog! I agree on the basil + tomato combo – pure brilliance! I’m not such a big cheese kinda girl, but have been making Caprese-minus-the-cheese salads a lot over the past couple of weeks! I love the simplicity of your recipe, and of course the gorgeous photos too! My sister is turning 22 this year and I’m going to be 25 in August, and even she has the ability to make me feel old sometimes! I think I need to check out the 20 vs 30 links you posted! Brothers are amazing for so many reasons. I had a dream last night with my brother and I surviving a scary earthquake. I should call him! So fresh!! 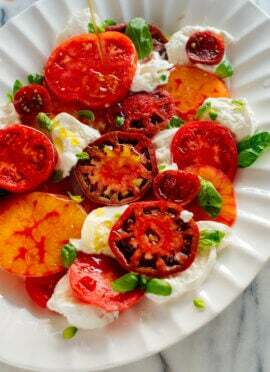 I love caprese anything and this is beautiful! Great idea to sauté the tomatoes until they burst. Caprese salads are something I look forward to every summer…the simplicity of the flavors is what great summertime dining is all about! I love anything Caprese, this is summer in a bowl! Perfect summer recipe. Also love Meg Jay’s “The Defining Decade” — should be required reading for every twenty-something. Oh, I didn’t know she had a book out! Just added it to my wishlist. Thank you. Ooooooooohheck YES. I’m going to cry until you feed this to me. Ha, I love the story of your brother’s visit. So spot on for a 20-year old guy. And still in my young 20’s myself, I’m all about affordable, but awesome meals like this. This is just my kind of recipe! I’m also imagining it with the leftover smoked mozzarella in my fridge. Yum! Caprese salad is my summer favorite. This sounds fabulous. Great recipe and easily the most empowering TED talk of all time! So empowering! I only wish I’d watched it in my early twenties. This looks like the perfect splurge meal! What a delicious idea for a pasta salad! Hey Megan, thank you so much for the feedback on the iPad version of the site. It is kind of confusing, but you can see more by flicking the page over instead of scrolling down. I was worried that option wouldn’t be evident, so I’ll bring it up with the developers. The recipe view isn’t ideal, but they will be launching an optimized recipe viewer sometime in the next couple of months! This totally made me laugh, Kate. There’s only 4 years between my brother and I, but he came to visit me when he was 20, and we had a very similar visit. I love the kid dearly, but he hasn’t totally grown out of all his college-student ways…although he’s left some of them behind. 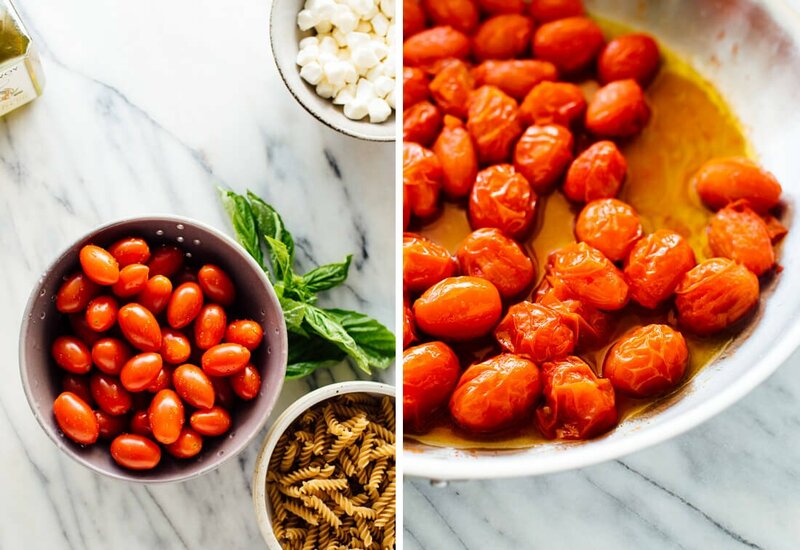 The burst cherry tomatoes are such a smart addition to this – must try this technique! I have been eating caprese-anything like it’s my 9-5 job this summer, so this is definitely a must try! Cooking the tomatoes a little before tossing with the pasta is such a great idea! 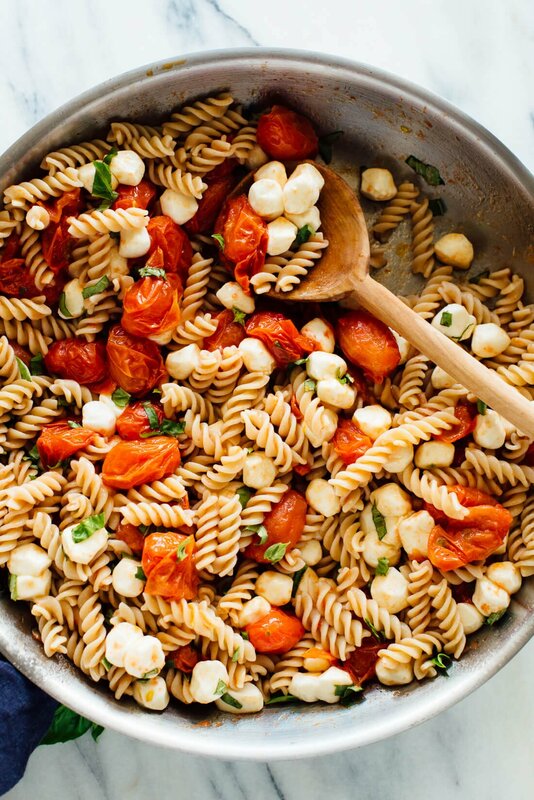 I just love simple summer pastas, so this is perfect. I actually used the whole package of wheat pasta (16 oz), so that I could have leftovers. I recommend this. So fresh and delicious! Thanks, Kate. Thanks for commenting! It’s great to get some feedback on this recipe. I haven’t heard much from readers about it, but I think it’s delicious! What a great pasta! So easy to and quick to make. Great for a family dinner on a busy night. Thanks, Shannon! I’m so glad you’re enjoying the recipe! Oh dear. Very hungry now! I rarely eat pasta but for an occasional treat, but this was Oh Em Gee delicious!! I quartered the tomatoes and cooked them a little longer than the recipe called for. My husband is already asking me to make it again! That’s great to hear! Thanks, Cindi! Just tried it tonight for dinner. So delicious! Although, the tomatoes took alot longer than 5min to burst in my olive oil. Glad you enjoyed it, Dures! Either your cooking temperature was lower than mine or your tomatoes were bigger than mine. Regardless, glad it turned out well! I saw this recipe on Giada. I don’t doubt that she has a similar recipe. I always cite my sources of recipe inspiration, though, and Giada wasn’t one of them. Haha! I can relate, Mary. I used to work at a college bar… although, I was definitely guilty of some late-night shenanigans myself. Hello! So I was looking at your recipes for a good vegetarian dish to make for my mother, who is stuck in bed because if her Multiple Sclerosis. I had already made her a healthy breakfast, so I wanted to make her a healthy lunch as well! So as I was looking for the ingredients to make this delicious dish, I realized we don’t have any cherry tomatoes left. So I, a 13, soon to be 14-year-old girl(one more week!) was wondering: is there any possible way to substitute the tomatoes with something else?? Thanks for taking the time to read this. Hi Sydney, I’m so sorry I didn’t see your comment earlier. I think tomatoes are pretty essential to this dish, but I hope you found a solution! Your mom is lucky to have such a great caretaker. I made this tonight and it was so delicious! But I did change it up a bit, since I wanted more vegetables. So I added baby spinach, chopped radishes, and roasted eggplant. Also subbed out the mozzerella for feta, because that was what I had. I loved this pasta! It was so easy and fast to make, and so fresh even when I heated it up the next couple of days. I’ll definitely be making this again. Thank you, Rachel! Glad to hear it! That’s correct. I like a lot of add-ins when I’m cooking pasta. Replace “a lot” with “excessive”. I used half the amount of tomatoes your recipe called for and my pasta:tomato:mozzarella volume ratio in the end was nearly 1:1:1. It’s your recipe: make what you like, but please don’t post misleading pictures like that. James, these photos represent how the recipe turned out for me as written. This recipe is perfect! I tried it with diced regular sized tomatoes and vegan mozzarella and I love it! Excellent! I made it just as you said. Will definitely be a favorite. Great recipe as I said before. The next time (and there will be a next time) I would wait till the pasta cools before putting in the mozzarella balls. Hi, Bruna! I’m so sorry to hear that you’re disappointed by the measurements. Incorporating metric measurements isn’t as easy as it seems; it’s an extra layer of complexity, effort and length. And, it adds more room for human error. I hope to start offering metric measurements on the blog someday when technology makes it a little easier to do so. I’m working on it! This dish was so simple to make and was absolutely delicious. Fresh and light flavours with a bit of heartiness added by the pasta and mozza. I cheated and just broke off pieces of a mozza brick instead of paying the extra money for someone to roll it into balls for me. Turned out amazing if only slightly less visually appealing. Sounds like a great way to make it your own! It matters what it tastes like. I am happy it turned out well. Thank you, Lauren for your review. This looks so good I can’t wait to try it! Do you mean 16 oz of pasta? This looks delicious, going to try today! Actually only 6oz :) Let me know what you think when you try it! This is so simple, but amazing! LOVE this recipe! Hands down my favorite quick and easy dinner. My favorite tweak is to swap out the pasta and mozzarella for a package of fresh three-cheese ravioli from my local market. Yum! I love that! Mouth watering good. Thanks for your review! Nothing makes me happier than a caprese dish! So fresh and delicious! Thanks, Gaby. Hello! Love your site!! Which TED talk was Olivia referring to?! Love how classic yet delicious this is! This was best Caprese Pasta I’ve ever made, thank you for a few valuable tips! Love to hear that, Natasha! Thanks for your star review. Looks awesome! I also like this pasta dish with rocket salad mixed into it. I made this recipe earlier this week as part of my weekly meal prep. SO yummy! I would definitely make again. I made this caprese salad for dinner last week and it was a hit! The sweet little tomatoes truly created a luscious ‘sauce’ for the pasta- it tasted like I spent more time on it than I did! Only changes were that I added some garlic salt and Italian seasonings to the tomato mash – along with a ladle on the pasta water (aka liquid gold). I couldn’t find mozzarella pearls so I used small balls (about the same size of the tomatoes), should have cut them in fourths. Also googled the Ted Talk many of the reviews mentioned and LOVED it! As a mother of two 20-somethings it really hit home. They loved it too. This salad was so delicious! All of the flavors just came together to make a perfect warm summer side dish for our grillled chicken. I’ll be making this often! This dish was simple, quick, and has a great bright freshness perfect for summer. A friend introduced me to this recipe recently and I made it again for family visiting me this week using a gluten free quinoa rotini pasta. It was a hit and everyone wanted the recipe. A new summer staple to add to my favorite recipe stash that will be made many times over! That’s great! Thank you, Angela. Thanks for sharing and for your review, Susan! Thanks for sharing an easy and delicious pasta salad recipe. This recipe is just perfect after work on a very hot summer evening.. It came together really easy and the tomatoes were done by the time the pasta had cooked. Absolutely delicious! It will definitely become part of the normal routine. I am looking forward to the leftovers for lunch today. I agree! Great for warm nights. Thanks for sharing! I really appreciate your review, Annika. The first time I made this my tomatoes were too big. They took a long time to burst and when the did there was too much liquid. That wasn’t really an issue though. It tasted great when warm but I was making ahead and planning on serving cold. The next day, I served it cold and the mozzarella was not good any more. Since it had been melted a little it was unpleasantly hard and chewy when cold. I’m making again today with the following change: I will stir the cooked pasta into the burst tomatoes (I bought smaller ones) add vinegar and salt then refrigerate. I will add the mozzarella and basil to the cold pasta prior to serving. Pretty sure it will be great!! Thanks for sharing, Heather! Mozzarella can be tricky sometimes. I’m glad you found a solution that works well for you. Lovely Pasta Salad. Great Item for salad. Next time, I might add a smashed clove of garlic or two in with the tomatoes and oil while I’m cooking them down, just for a little extra flavor. But I thought it was delicious! And it was the perfect weeknight meal – came together in a flash! Thanks for the recipe. This is my go to weeknight meal and I have shared it with all my friends! So quick and easy. My kids love it, my husband loves it, I love it! Yum! Wonderful, Katie! Thank you for your star review. Perfect caprese flavors, which I love. Next time I’ll let the pasta cool to room temperature before adding the mozzarella so that it doesn’t melt and clump together! Yes, make sure you let it cool some. Thanks so much for your review! You’re welcome! Thanks for the support, Quinton. I found this recipe last week and have cooked it twice since. Its simplicity makes it a perfect weekday recipe. It also makes a great leftover for lunch the next day (I ate it cold and it was still good). “Cover the skillet (use a baking sheet if you don’t have a better lid)” is a very important step. The tomatoes, even the dried ones, go crazy as they burst out of their skins from the heat. Awesome recipe! Thank you Kate! I’m glad the instructions were helpful and that you have made it twice already! Thanks for sharing, Jee. I’m so happy you did, Paul! This one is great for summer. I appreciate your comment and review! They are there! You just need to click to expand to see the nutrition information. Hope this helps, Roe! OMG, this was SOOO good! Thanks for the great recipe!!! This was delicious and so easy! Had it warm for lunch today and can’t wait to try it cold for lunch tomorrow. What did you think about it for lunch cold, Elizabeth? It was ok cold, but I much preferred it warm. I’m not sure the cooked tomatoes worked for me when cold. But warm it’s perfect! I have made this recipe about a dozen times now. It is seriously a family favorite – so quick and easy to put together, and so delicious! Thank you for this! Tasty and simple to make. My husband and I love this recipe so much! It’s super quick and simple, we make it about once a week! Thank you for sharing, Lisa! I appreciate the review. Could you use chickpea pasta for this? Very good recipe all-in-all, but was exceptional when we added garlic powder at the table. Sauteing some fresh garlic with the tomatoes and olive oil might be even better than garlic powder. I suppose adding garlic makes it not truly Caprese, but my taste buds thought it was a nice addition. I would have given 4.5 stars if that were an option.